It’s time to go phew that Mercury retrograde is finally over! But is it really? You will still be feeling trickles of it lasting till the 6th of November but it’s not going to be anything like experiencing the full blown effects while being in the midst of it. So watch out the communication at least for another week into November. Hold off any confrontations or cleaning up any misunderstandings that took place in October. In fact, I suggest hold any of these off till the end of month. November is going to kick off with a feeling of wanting to throw yourself into a project or an idea that you have had on your mind for a while. Feeling ambitious and wanting to put an end to weeks of procrastination and unproductivity seems to be high on the agenda. Once the effects of the Mercury retrograde finally wear off, the second week unleashes a surge of passion be it in what you do for work or in a relationship. If a misunderstanding has brushed the two of you in October then the second week of November seems like the perfect week to kiss and make up and reignite the fire in your relationship once again. Overall, being the month of Scorpio you will find passion lingering around for some time so make the most of it to pursue your creative passions if a relationship isn’t on your cards. You can’t help but feel something good is about to unfold during the third week. However, you tread with caution and don’t want to get too excited too soon. A sense of distrust will arise during this time and uncertainty to the outcome of your efforts. Keeping the faith and staying positive will become a big task at this time. The final week of November brings along healing and hope. This is the time to make right whatever that went wrong in your past. You look forward to the future in the hope that all things will go well. It’s a time of feeling positive and accepting help which comes your way. It is indeed a very harmonious time for spending time with family and friends. And why should it not be as it is also Thanksgiving after all! How apt is that? Ahhh isn’t it nice to feel so positive and happy in your birthday month? Dear Scorpio, you will feel like you are on cloud nine this month. Love seems to be all around you. Be it in the company of great friends, family or a lover. Bask in it as you deserve this. Last month was all about walking on egg shells with people around it but this month seems to be the complete opposite. Everyone around you seems warm and giving. You will feel a stir in your creativity as well. So start off that new project, business idea or even new job while you are high on positivity and happiness this month. You begin your birthday month with a de clutter of your mind and to seek out meaningful experiences that enrich your soul. You feel the urge to list all your dreams and/or listing constructive steps on how you may achieve this for this coming year. Picking up a new skill, reading up on a subject or even going back to school may not be a remote possibility for some of you Scorpions. Though opening yourself up to new experiences is hot on your pursuit you still remind yourself to create a sense of balance in early 2015. This may mean taking on an alternative holistic lifestyle, cutting back on vices and adopting a healthier lifestyle or just retreating within to appreciate what you have in your life. The start of 2015 may also bring on a desire to expand your family or celebrate the arrival of a new member of the family. For others, it will be a time to practice consideration of the feelings of others or display an outpour of emotion for all near and dear. Towards the end of March 2015, a review of the list that you made at the beginning is due just to make sure that you are on track. For some, it may be time to make a change in your career, put your business ideas in motion or go get that love of your life. Basically, be bold and go full steam ahead with your plans whatever they may be. In the midst of soldiering on, there will be times where your actions will come into question around May to June 2015. This is going to be just a passing phase and do not allow yourself to be distracted. Mid-year seems to be a good time for your finances. In fact, you will begin to see your finances improve from April. But it’s in June that you will reap the benefits of all your hard work so give yourself a well-deserved summer break. Work related travel may spring up July onwards. It could be as temporary as a few months to a few years or it could simply be a move overseas for personal enrichment. Whatever travel plans you may have will be linked to some sort of self-improvement. The final quarter calls for an assessment of structure in your life and to put things or people in order. You may also be in need of some advice from a feminine energy or give attention to a troubled female in your life. The year seems to end with some sort of an emotional roller coaster if not for yourself it may involve someone near to you which you will be involved heavily with. You have been feeling very overwhelmed with a zillion things going on at once in your life. It feels like all your worries and troubles arrived at the same time and this has left you very worn and tired. The worst of your nightmares are finally over as you are struck by a light bulb moment where you find yourself more in control of your situation and begin to devise plans on how you are going to get yourself out of this mess. You will be feeling very pleased with your progress. This month brings you the opportunity to plant the seed for a new beginning in your life. New luck, good health and prosperity in relation to work surround you in this month. Build on this good fortune together with your desire to become better to make the most of the month ahead. Things seem to move very quickly this month. There won’t be time for you to stop and think about an opportunity. It’s either you grab it or lose it. As the saying goes time waits for no man seems to hold very true this month. You sharp tongue and quick wit might land you in some arguments as well. But as soon as they arise they will resolved. However, the episode will leave a bad taste is people’s mouths so just hold your horses a little bit. For some it may be a month of exploring travel to faraway places. There is a desire to explore new things in your life. It could be anything from travelling to an exotic destination for a spiritual retreat or going skydiving in the dessert somewhere. You seem to be moving in every direction and exploring the unknown. If you are single, you will be opening yourself up to possible future partners like you would not have in the past. If you have been unhappy in a job for a while you will be in the mood to risk stability to seek starting out a business of your own. It seems like a very fun time for you this month. This buzz of energy and passion seem to bring about changes that you never imagined could happen in your life. Finances aren’t really the best for you dear Leo this month. Hold on to what you got. Do not make unnecessary commitments. Hold it off till you feel more comfortable. A generous person though you are by nature it’s best to keep this to a minimum at all levels this month. This could mean holding back your emotions, spending your money or sharing your experience and knowledge. Lie low and just ride through this month with your head down. You may call this a “Eureka” month for yourself. It seems like you finally find a solution to your problems this month or provide assistance to someone who has been facing a dilemma for months. Remember to accept advice as much as you impart it. It works both ways. You may not necessarily be right all the time so this may also be the time for a humbling experience. Do not get ahead of yourself this month. You haven’t really turned around your problems you have only discovered a possible solution. There is more work to be done in making things happen for you. 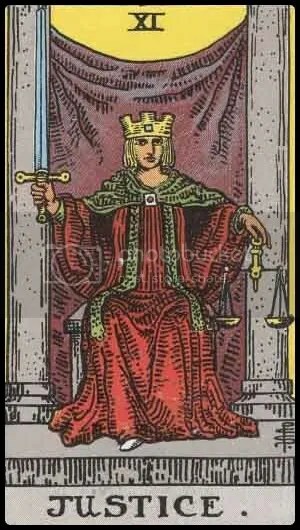 What a perfect card for the sign represented by the scales! If you have been over indulging in any aspect of your life then this month calls for putting things back into perspective. It’s time to rationalise things with a cool head and ground yourself as you have been all over the place last month. Having a lot of ideas may not seem to be the best so it’s time to weigh the pros and cons of everything and choose the best fit. You cannot have too much of anything or you will get sick. So balance is the order for the month for you. If you have been working hard on something in any area of your life you will be recognised for it this month. It is a nice feeling to be recognised and cheered on for a change so do enjoy this moment of glory but also do not let it get it your head such that complacency sets in. You have to keep up the momentum to achieve this recognition again and again. Keep a note of what you have done right to deserve this and plod on. You may find yourself a washed with emotions that you never felt before and/or feeling overly sensitive and vulnerable. The ‘new’ feelings might be for a person or a passion for something that you have newly discovered. Go along with it and explore this new wave of emotions. This may also lead to creative and artistic pursuits for some like music, art or writing. Delving in will lead to a lovely experience so just go with the flow. You feel awakened with a sense of clarity in your mind like never before. The direction to take is appearing very clearly right before you whereas just a couple of months ago you were in a very muddled state of mind. Your recent experiences and knowledge are leading you to share with others. Writing articles or doing more research in your field of interest will bring you greater recognition and more assurance that you are heading in the right direction. You seem to make a success of anything that you lay your hands on this month. Be in starting a business, making changes in your work or family environment or just tending to your flower or vegetable gardens. Beautifying your surroundings will feel important to you. A beautiful environment equates to feeling happy and in turn leads to your success. So make the most of your patience and sheer sense of determination to make your dreams into a reality for this month.